I met a guy who was looking for someone who could repair an 100 years old camera inherited from his grandfather. It's an Ernemann Klapp Model I, dated between 1903 and 1911. The ebony with which some parts were made had become so brittle that any little movement or pressure would break it. It had the lens back carrier broken, so the lens could not stay in place. The lens sits on its lens plate which slides into the rest of the lens back carrier. 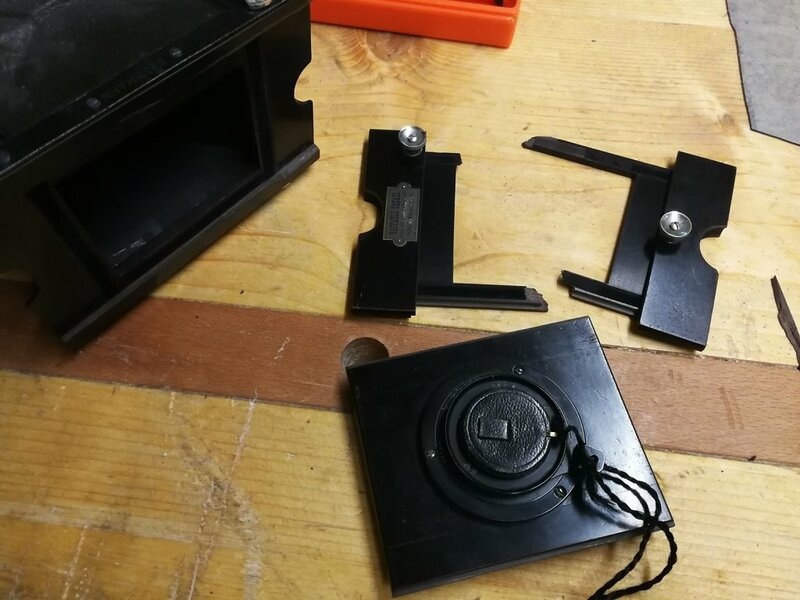 The lens plate is kept in place with two locking knobs that tighten it up by pushing it down, so the lens plate can be removed by focusing the lens to infinite, undoing the knobs and sliding it down (or up) and remove it. The whole carrier plate got broken so the lens could not stay in place.